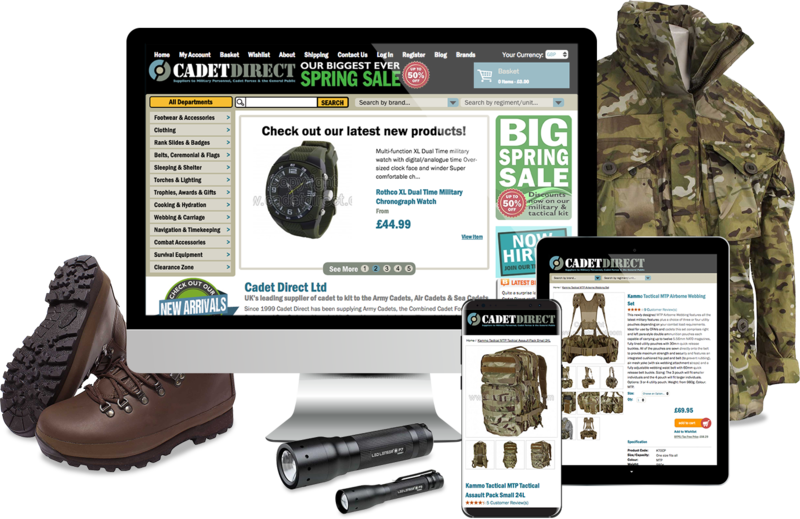 Established in 1999, Cadet Direct is a leading supplier of military clothing, footwear and equipment to serving UK’s Regular, Reserve and Cadet Forces. Their sister website, Survival Aids, has quickly established itself in the last 10 years as a leading UK supplier of similar products to emergency services and police forces. Cadet Direct encountered technical challenges from the previous agency they had worked with. This previous agency could not tackle or overcome these technical hurdles as they lacked skill and experience with the Magento platform. The biggest setback to the current site is that the time frame it took to deliver the project resulted in hurting Cadet Direct’s business. 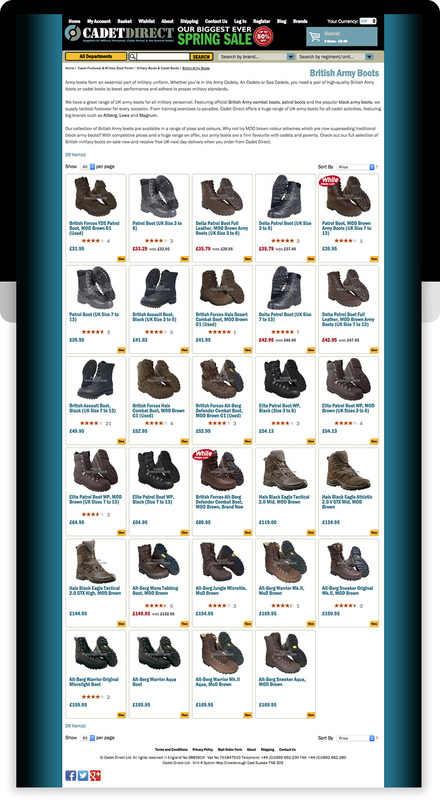 Re-launched Cadet Direct and Survival Aids as a Magento multi-store with multiple currencies to select from in order to cater to a wider demographic. We applied a new responsive theme to both websites and made sure that both stores are mobile friendly across a variety of mobile and tablet devices. We created custom functionality and modules with advanced functionality that helped improve the overall usability and shopping experience, including ease of shopping and a clean and focused checkout process. We ensured the coding quality followed Magento’s best practices and ensured the website’s speed was optimised, targeting faster load times. On top of this, Cadet Direct’s Magento platform is now hosted on our state-of-the-art enterprise-level hosting platform and have seen a tremendous improvement in the page load and stability. Cadet Direct was pleased to see their website launched without any hassle delivered on time. They are very pleased with the Magento platform, with its extensibility and modularity, including out of the box functionality for managing a product catalogue, support for payment options, newsletter integration and managing extensive content. The Magento platform is hosted on a scalable environment with multiple backup redundancies in place and PCI compliance web servers. This has made Cadet Direct feel secure and safe to know their data and website is fully protected. In 2015 Cadet Direct have seen a tremendous increase in revenue and have since achieved their highest online earnings. With the new mobile friendly website, we have seen an increase in mobile visibility and engagement, and decrease in the bounce rate. 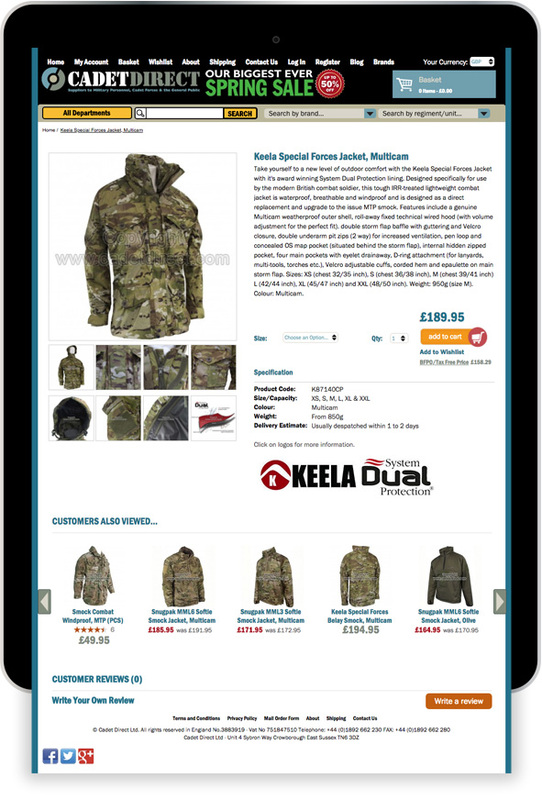 R & W Media continue to work with Cadet Direct and provide on-going support and maintenance to their large eCommerce stores. We regularly interact with their SEO agency to continue to expand their business online.